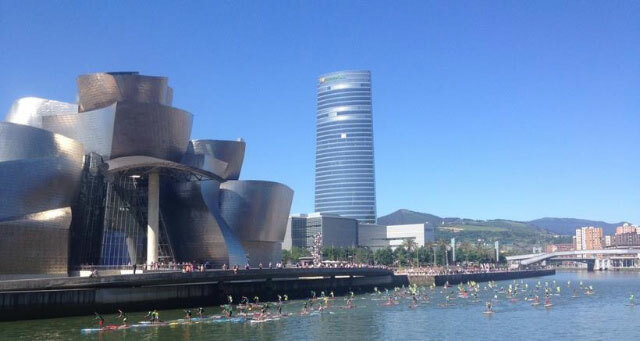 I just finished the Iberdrola Bilboa World Race Series European Cup stop 1 and it was CRAZY! Last year I had such a great time racing there that I knew I wanted to come back again this year. I finished 2nd place overall there last year and really wanted to improve on that result, but I knew there would be some great competition from the local European Sup racers and the Australian racers. The European sup scene is growing so much and producing such strong racers (thanks to Eric Terrien, Casper Steinfath, Leonard Nika, Gaeten Sen and many of the other Sup pros from there). Every race there seems to have so many more racers and also so many more spectators. The support of the fans and local communities is inspiring. So I had planned to come back and race, but then at the last moment, Starboard asked me to fly to Tahiti with Sean Poynter, Izzy and Georgio Gomez, and Justin Holland for a dream photo shoot in the waves with local Starboard team rider Tama Audibert. I had to go because I love Tahiti! It is one of the few places other than Hawaii that gets me really pumped to surf big waves. This meant I was trying to be in two places at once. So I stayed in Tahiti until the 5th of June, and then flew straight to Spain. I knew it was risky getting there so close to the start of the event, but I didn’t really have a choice. Normally I like to arrive at least four days before an event, to check out the conditions, lose the jet lag, and get acclimated to the time change, and make sure all my equipment makes it on time, but I couldn’t this time. I didn’t even arrive in Spain until after midnight the day before the Sprint Races started. I wasn’t even registered yet. When I arrived at the airport, I quickly realized that Iberia Air lost all my luggage. EVERYTHING!!! I didn’t even get my suitcase, so all I had was my backpack. I was so bummed! I just flew all the way to Bilbao to race in one of the most important races in Europe and now I had no equipment. While I was filling out all the paperwork and trying to explain in very bad Spanish to someone who spoke no English, that I was missing all this equipment. It took another hour. So while I was filling out paperwork at the opposite end of the airport, my good friend, host, and local Spanish Surfer, Lurta Ezkurdia (and owner of the very cool Barrika Surf Camp) was walking all over the airport looking for me. Of course to add to my trouble, after a 30 hour flight from Tahiti to LA, to London to Madrid, to get to Bilbao…my phone died, so I couldn’t call him to let him know where I was. After one hour he left, thinking I missed my flight. So when I was done, it was now after 1am the day of the race. Luckily I had flown with a local surfer name Guillermo, who saw that I was still at the airport and helped me out by offering me a ride to Barrika Surf Kamp to meet up with Lurta. Guillermo and Lurta are friends, so he knew just where I was staying. Thanks Guillermo!!! Savior #1 The next day Lurta and I showed up to the beach, with me having less than 4 hours of sleep, with borrowed shorts, and NO EQUIPMENT, but I did have the coveted Yellow #1 Jersey!!! As the defending champion of the Sprints. The local Starboard rep Pascal Pouget and local surf shop BWaters helped me out by loaning me a Starboard Race board, and paddle. Saviors #2 and #3… The paddle was about seven inches too long for me, but beggars can’t be choosers, and I just toughed it out, choked the paddle shaft and raced all day. I was exhausted but my competitive spirit fueled me to not give up and just give it my all. I raced amazingly well for someone with 4 hours of sleep, and ended in the Finals with a familiar group of pro athletes that I race against everywhere all over the world. Casper Steinfath was just coming off a big win in Nicaragua, Jake Jensen is always a threat, Paul Jackson is always right there pushing us all, Leonard Nikka is improving every single race and getting faster and faster, and I had never raced against Titouan Puyo but I have heard from everyone he is FAST. So it was a great lineup. Casper got a bit of a lead around the first buoy, and just beside me I saw that Jake Jensen had some really bad luck too, snapping his paddle right off the start, leaving him out of contention. In sprints we are always pretty bunched together, but Casper got the edge, with Paul and I just right behind him. I was bummed since I won the Sprints last year, and I had to settle for 3rd place. This made me even more hungry to do better in the Long Distance race the next day. But after going to the airport twice that day, I knew I wouldn’t have any of my own equipment the next day either. I even had to borrow a water pack, so I can’t say Muchas Gracias, Mahalo and Thank you enough to everyone who helped me out with equipment to allow me to race. Savior #4 The Long Distance Race is beautiful, passing the Guggenheim museum, the famous Steel Spider as I call it, and the City of Bilbao, but when we are racing we aren’t sightseeing! We took off and quickly separated at once into two different leader packs. I stuck with the one hugging the wall, and kept the pace with Leonard, Jake, Titouan, and Casper, while Gaeten was trying to pass in the middle of the river. Our pack of about 5 stayed together pretty much throughout the race trading leaders, until the last 1km or so, when I knew I had to make my move. I had saved a bit of energy knowing that I would have to really power the last few kilometers. Jake and I seemed to have the same plan, but luckily I had enough speed to pull away from the pack and stay just ahead of Jake. I was so stoked to win, but really glad that Jake came in second since he had such bad luck in the sprint finals. We have all had some sort of equipment failure and after training so hard, it is a bummer when it happens in a finals. Titouan came in 3rd just behind us. But this was really a Starboard Long Distance Race with 4 out of the top 5 all on Starboard (and 7 out of the top 10!!!) At the awards, all rumors were put to rest that the World Series doesn’t pay their athletes on time. We were paid out in CASH on the podium!!! Leaving the awards presentation a few local losers jumped us, knowing well that I had a big stack of Euros in my wallet. I fought to keep a hold of my wallet and got thrown to the ground, but again lady luck was on my side, because my wallet opened just enough that a big stack of cash fell out on the ground before the thief started running away with my wallet. Beau O’BrienSavior #5 tried to chase after him, but by then the thug was too far gone. My wallet was stolen with all my credit cards, drivers license, and most important with all my traveling I do was my American Executive Club membership card haha… But when we got in the cab, and started counting my cash to see how much the thief got away with I really knew I was the luckiest person alive… I had all of my prize money in my hand!!! They could have gotten over $5,000 Euro but luckily my wallet opened enough for the folded stack of money to slip right out. My mom Savior #6 came to the rescue in the middle of the night canceling my credit cards, ordering new ones fed exed to Spain and calling the fraud departments of my banks… but miraculously I was only out time and got a bit of a head slam. Lucky me. All my equipment, and my luggage arrived today (4 days late)… My race board was buckled, my paddle broken and my new inflatable torn, I guess Iberia wasn’t done messing with my adventure. It looked like a plane had driven over my board bag, But I had my luggage back, they are going to have to pay for the broken equipment, and I am now enjoying teaching a Zane Schweitzer SUP surf clinic at the awesome Barrika Surf Camp with Lurta and his family. Savior #7 Having fun surfing and meeting more new friends in Spain. So it was Up and Down in Bilbao – but I was always having fun! “Inspire & Innovate” and See you on the water soon!